When life gets busy, the house tends to suffer. It’s only natural. Laundry piles up, clutter starts to take over and before you know it, you’re feeling overwhelmed. The good news is you don’t have to be a super organizer or an interior design whiz to have a beautiful, organized home. Try some of these simple organizational systems and you’ll always have the tools you need to keep everything tidy and clutter-free. Put a “sorting station” near your entryway, complete with hooks for hanging purses or bags, a shelf for phones and keys and a basket for incoming mail. You can pick up some quite stylish looking baskets at the dollar store! Hang a large calendar and chalkboard on your kitchen wall. Having an accessible and easy-to-read planning center in the busiest room of the house will help keep you organized and on top of your to-do lists. 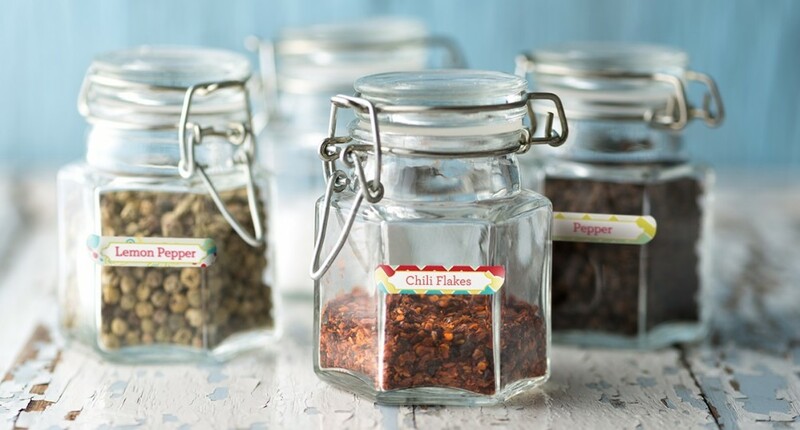 Clean old glass jars and use them to store all of your spices and baking ingredients. Add Mabel’s Labels Spice Jar Sticky Labels to the front of them and you’ve got yourself a highly organized and beautiful pantry! Keep linen closets neat by storing folded sheets inside their coordinating pillow cases. You’ll never end up with mismatched beds and your closet will always look tidy. Want to take it a step further? Label the shelves too, and stash everything based on which room it’s for. Store rolls of Saran Wrap, tinfoil and wax paper in magazine holders, mounted flat against the inside of a kitchen cabinet door. Keep dry erase markers next to your washer and dryer so you can scribble laundry instructions on the tops of the machines for any unexperienced members of the house. No more mishaps and it wipes right off! Cure crowded bathroom counters by storing things like cotton swabs, Q-Tips and makeup brushes in large glass apothecary jars. The display looks great and you’ll always know when it’s time to restock.